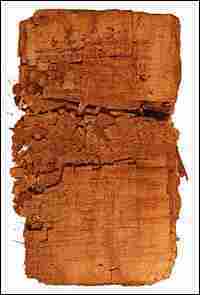 Ancient Text Shows Judas in a Different Light For much of the history of Christianity the popular belief has been that Judas betrayed Jesus. But the translation of the Gospel of Judas made public by National Geographic Society tells a different story. Steve Inskeep talks to Marvin Meyer, professor of Bible and Christian Studies at Chapman University in Orange, Calif.
For much of the history of Christianity the popular belief has been that Judas betrayed Jesus. But the translation of the Gospel of Judas made public by National Geographic Society tells a different story. Steve Inskeep talks to Marvin Meyer, professor of Bible and Christian Studies at Chapman University in Orange, Calif. 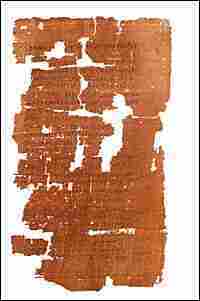 The translation of an ancient Papyrus text is offering an alternative view of one of the most notorious people in Biblical history. The text is called the Gospel of Judas. It attempts to explain acts of the disciple who betrayed Jesus in exchange for 30 pieces of silver. The text turned up in the Egyptian desert in 1970 bound as a book known as a codex. Terry Garcia's with the National Geographic Society which arranged for the translation. Mr. TERRY GARCIA, (National Geographic Society): This codex which is more than 1,700 years old and has traveled a very long and, in some cases, circuitous road to be here today. INSKEEP: We're joined here now by Marvin Meyer, a professor of Bible and Christian Studies at Chapman University in Orange, California. Mr. Meyer, welcome to the program. Mr. MARVIN MEYER (Professor of Bible and Christian Studies, Chapman University): Yes, thank you, good morning. INSKEEP: The story first, please. What does Judas say in this text anyway about betraying Jesus? Mr. MEYER: Well, in the gospel of Judas, Judas turns out to be the hero. He is the one who has true insight into who Jesus is. He understands where Jesus came from. And finally, at the very end of the text, Jesus asks Judas to hand him over. Because thereby, Jesus says, Judas will help Jesus to sacrifice the man that clothes him and thus free the true human being, the divine essence of Jesus that is inside. INSKEEP: The idea that it's all predetermined, this has to happen anyway so it might as well be Judas who does the job. Mr. MEYER: Well, it's all good news for Judas. Judas simply goes along with his good friend Jesus and does what Jesus asks him to do. So the so-called betrayal, the turning over of Jesus is something that is a friendly act that Jesus wants Judas to accomplish. INSKEEP: Who wrote this text some 1,700 years ago? MEYER: We don't have any particular idea of the name of the person who is the author of the text. But, it comes out of the middle of the second century and it comes from a Christian community that has a very mystical kind of orientation--that believes that the real essence of a human being is the inner human being. That's the true human being. And once that person comes to expression, then salvation is realized. INSKEEP: And how did their scripture, their text, not end up as part of the Bible? MEYER: Well, the selection of text that are to be included in the Bible proved to be a very long and contentious business. Some texts carry the day and some texts did not carry the day. Often, that was determined by the number of people that preferred the text and how loud the voices were that were advocating a text. And the gospel of Judas didn't make the cut. INSKEEP: And why do you think this discovery is important? MEYER: Well, this is an artifact of our religious history, our cultural tradition. It was, in fact, on the verge of being gone as a text, as it was falling apart and decaying and the papyrus was in horrible condition. And now it has been put back together again. And so this is one of those incredible moments of being able to regain an item that is a part of our cultural heritage and that is worth celebrating. INSKEEP: What kind of a writer was this person? This unknown person or persons who wrote this: good storyteller, joke teller? MEYER: You know, the fact of the matter is in this particular text, Jesus laughs a great deal. This is not a somber kind of Jesus. This is a Jesus who sees humor and can laugh at life, and laugh at the disciples, and laugh at the way things turn out. And that seems to be a reflection also of the author who's writing something that is full of life and liveliness. It's good story. It's a dynamic story that is told. INSKEEP: This must be causing excitement among some Christians and consternation among others. MEYER: Well, I suspect that everybody is going to have his or her own opinion on this. We're looking forward to the discussion of this text. The text itself is all about one of the varieties of early Christianity. And if people get on board and look at the varieties, and celebrate the varieties of early Christianity, I suspect we'll all be the better off for it. INSKEEP: Marvin Meyers is a professor of bible and Christian studies at Chapman University in Orange, California. Thanks very much for speaking with us. INSKEEP: And you can look at the crumbling text of the Gospel of Judas at NPR.org.